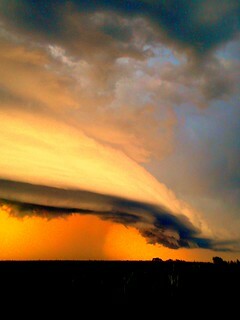 080711 - Nebraska Supercell / Arcus / Shelf Cloud! Taken just days after I had smashed my Nikon D50. Strong Gust front took out 3 of my best cams. I had nothing but a crappy cell phone to take these pics. Just leaving my pad, looked out to the Northwest, and my jaw about dropped. It was still 20+ Miles away, I just knew she was coming our way... due to radar and warnings out for western counties... but the outskirts of city limits the clouds told the tale... She was going to be a photographic beauty. My Daughter was hungry for the BBQ but she also wanted to see this storm up close and personal. I gave her a choice... BBQ or Storm.....she wanted to see the storm and we were off to our storm adventure! It was one of the best photographic shelf clouds of 2011! Glad we were there to capture this! NebraskaSC's Storm Chasing Apparel & Stuff !!! Available Now!! !